When I retired from professional chess, one of the things I was looking forward to was playing for fun. Without the pressure of having to maintain my ELO rating, I was looking forward to playing attractively and creatively, and I was hoping I’d react calmly when the inevitable losses came along. That never quite happened for me! As soon as I sit down at the board, all those old competitive feelings flood back and the bad games hurt just as much as they did before! The one time I do manage to see chess as a nice hobby is when I take the time to sit quietly at home with a board (no computer) and a classic games collection and just analyse a few games. It’s those moments that keep me loving chess and maintain my interest in the game. 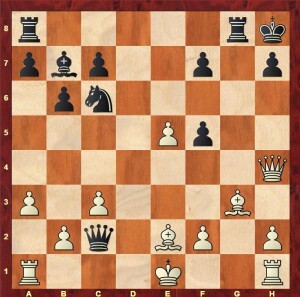 This is the position after Alekhine’s suggestion 21…Qc2 instead of the tame 21…Qe4 as played by Euwe. It’s important to remind yourself that Alekhine produced his analysis without recourse to a chess engine! Black’s king’s position looks horrible and his counterplay with his queen doesn’t look that threatening for White. It takes a great deal of imagination to even think of analysing this position any deeper! However, once you do, you realise that appearances are deceptive. The essential problem is that White’s king is pretty much stuck in the centre. He will need to use the g-file for his rook as part of a mating attack but that leaves his own king vulnerable to Black’s simple plan of …Qxb2 and …Qxc3+. White also doesn’t have time to consolidate his position: …Rg6 is coming which would cover White’s most dangerous entry point (f6). White has to strike now, but this haste leaves his own position exposed. Alekhine’s brilliant idea, using his attacking queen on f6 to perform defensive duties covering the c3 check while introducing the idea of Be5 placing unbearable pressure on the rook on g7. 24.Bf4 Qxc3+ is extremely embarrassing as 25.Kf1 Qxa1+ leads to mate! Again a brilliant suggestion of Alekhine’s and the strongest move. When I demonstrated this analysis at my local club, my club-mate Shahroez suggested 25…Nb4 with the same basic idea as 25…Nd4: to open up the a8-h1 diagonal with tempo and thus introduce the threat of …Bf3. 26.Be5 Nd3+ 27.Kd2 Qc1+ 28.Ke2 Qb2+ 29.Kxd3 Ba6+ 30.Ke3 Qc1+ 31.Kf3 Bb7+ 32.Ke2 Ba6+ 33.Ke1 is the way to go! 26.Qxg7+ Kxg7 27.Bh4+ Kh6 (27…Kf8 28.e7+ Ke8 29.Rg8+ Kd7 30.Rd8+ as pointed out by Alekhine) 28.Bg5+ Kg7 29.Bh4+ is White’s best line as suggested by Alekhine. I was attracted to 26.Qxd4 as I didn’t quite believe Alekhine’s analysis. There are some improvements in specific lines, but Alekhine’s evaluation stands! 28…Bd5 29.Qe5 Bf7 30.Qxg7+ Kxg7 31.Be5+ Kh6 32.Bg7# is the gorgeous idea. However, Black can be very boring in 2 ways! 29…Kf7 is just winning for Black. So Alekhine was right: 21…Qc2 is a stunning saving resource and White’s best is to force a brilliant draw with 26.Qxd4 in the above line! Wasn’t he good? While flicking idly through the April 2016 edition of New In Chess magazine, I came across an article by one of my favourite authors, the Rumanian Grandmaster Mihai Marin entitled “Alekhine’s computer moves”. Mihai Marin’s article about Alekhine’s computer moves in the April edition of New in Chess. In his book “Learn from the Legends – Chess Champions at their Best”, Marin wrote a fantastic chapter about Alekhine’s skill in Q & R vs Q & R endgames so he really knows his Alekhine! In my analysis to the game above, I wrote that you had to keep on reminding yourself with disbelief that Alekhine made no use of a chess engine! Marin is of the same opinion and puts his childhood hero Alekhine forward as one of the first players in chess history who played computer moves in his games! Part of the evidence to support his theory is the Alekhine-Euwe game above and it’s nice to see that he comes to pretty much the same conclusions! After 21…Qc2 22.Qf6+ Rg7 23.Rg1 Qxb2 24.e6 Qxa1+ 25.Bd1, he also notes that 25…Qb1+ loses to 26.f3 and he also concludes that White’s winning attempt 25…Nd4 26.Qxd4 fails to 26…f6 27.Qxf6 Kg8. I’ve done exactly the same in the past! In the chapter on Capablanca in “Chess for Life”, I describe how – alarmed by the level of my play and deeply fearful of the prospect of facing Kramnik and Svidler in 2-game mini-matches at the London Classic in 2013 – I used a study of Capablanca’s games to freshen up and improve my play. It was a great success for me too as I managed to fight with both these great players on equal terms. It’s wonderful to hear of someone else using this training method successfully as well!